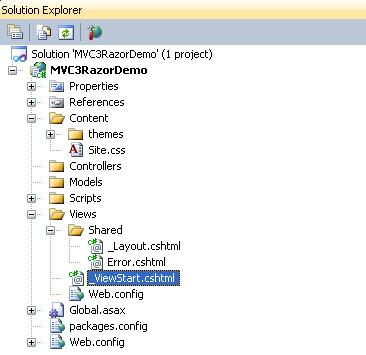 This article will describe about the MVC with Razor Engine (MVC 3). It also describes about how to create the Controller classes, Model classes and generate the Views automatically through the Razor Engine. 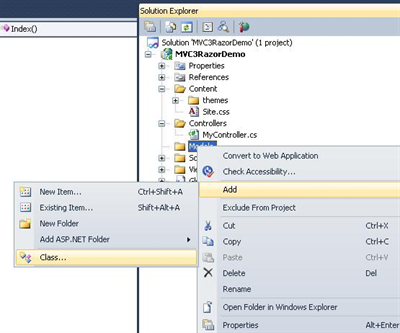 The article explain each and every steps which need to be done while creation of MVC3 architecture in ASP.Net. This article will be useful for those who want to learn the MVC3 in ASP.Net. MVC (Model View Controller) is the architecture of triad where each components- Model, View and Controller are independent to each other so that each of these components are loosely coupled which makes the MVC architecture more expandable and scalable. So this architecture is basically used when the project needs scalable in the future. 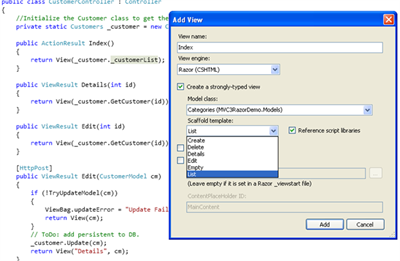 MVC3 application : The article is explaining about the creation of a sample application. Controllers- To create the actions and events related to the View (UI) . Models- It's the mediator which is used to carry the data from Model to View. View- For the UI (User Interface). By default it creates few views which are used for layout purpose, for showing the error and the start page. 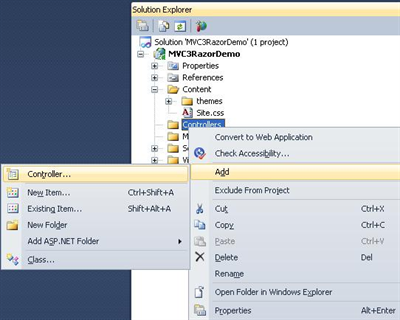 Also we can observe here the different symbol and files in view with the extension cshtml(C# Html) . So these are used for the View in MVC3 Razor application. 3. Now the first thing is that we need to create the Controller and Model classes. 5. Add Controller window will be displayed. 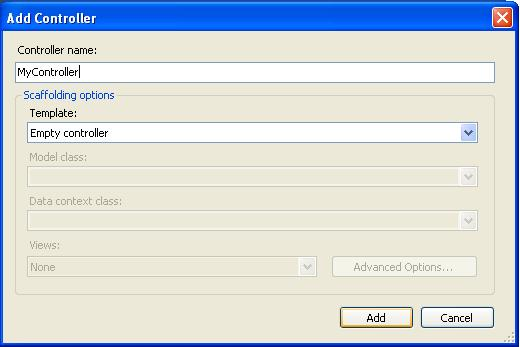 Now provide the name of the Controller "MyController" and click Add. The Empty Controller will add the default Index method while other option "Controller with read/write actions and Views, using Entity Framework" will create the Controller methods which will support the Entity Framework mapping. The Controller with empty read/write actions will write the default method for read and Write actions. For Now, we will choose the Default one- Empty Controller. 6. Now, to display the data, we need the Model class which will be used to hold the data. So create a Model class. 8. 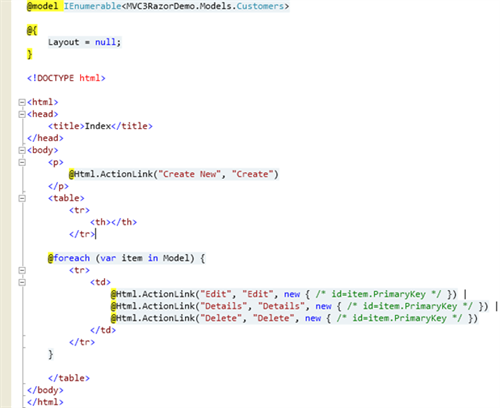 Provide the name "CustomerModel" and click OK.
9.Here in this class, we will define some public properties which will hold the data during the execution. 10. Also I need a class which will have the list of customers to display. So I will create a new class called "Customers" inside this Model class which will use the public properties and get the customers data. I am not using here the Database connection but you can write the database connection, command etc in place of list to get the required customers data. 11. Create a new class "Customers" inside the Model class and initialize the list of data inside the constructor of the class. 12. Till here, we have done so for is to write the Customers class in the Model which is having the list of customers. If you are not able to get this reference, then build the project and then try to add it. It will be added. 16. Here we can see that we can add the View for the Controller class method. Also there are various other options like if the View is already exists, then we can go to the View etc. Create a strongly-typed view- This is the checkbox which is used to create the strongly types view. It means that the view will be binded with the data source directly. Model Class: This dropdown list will show the classes exist to select for the View. Scaffold Template: Lit of template for the view. 18.When clicking the Add button, it will generate the code automatically for the view. In the above example, I have selected the List so the list of employees will be displayed n the View. 20. So this is the way to create the views for the application. 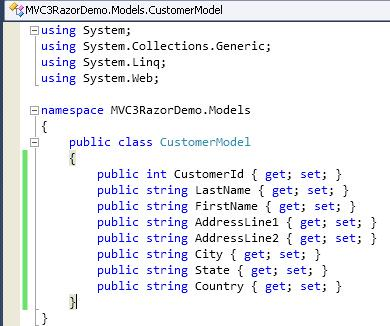 Like this we can create the MVC architecture with Razor engine (MVC 3) . Basically the work of Razor Engine is to create the Views automatically without writing any code. 1. 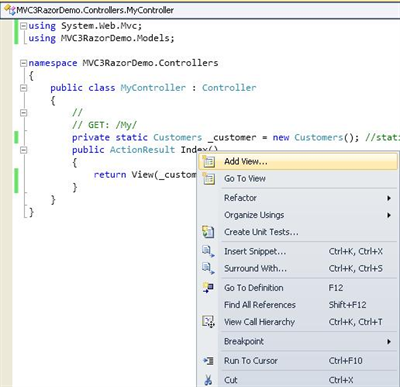 The processing of MVC application starts from the Controller class. The controller class takes care of handling each actions and events which are raised from the View or front-end. 2. Client or the end user requests for the particular page by doing some action to the application. The request starts with the controller class. The controller class contains the events and action methods which get triggered and then the processing starts. It means there must be a controller class with the name CustomerController.cs which will have a method called GetCustomerDetails and this method will use the parameter as 101. 5. So this whole URL will be parsed and will get the required information related to controller class, its method and the parameter (if any). 6. After parsing this URL, the runtime engine searches for these components and does the processing accordingly. 7. In the GetCustomerDetails method, there will be the call for the Model class to process the request and get the response back to the controller and then open the View with the returned data. Can you explain how to do validations in mvc? In MVC, we do validations at Model level. We use the concept called Data Annotation. This is the new concept which introduces with MVC and now you will see in the latest version of Visual Studio(2013 version) for all the the languages, we will do the same. 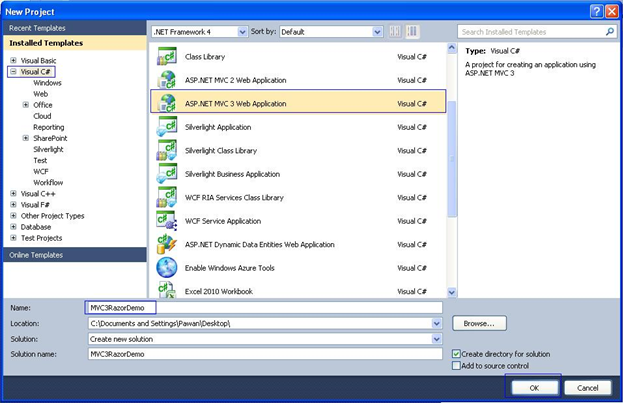 They have full support for ASP.Net also in the new and latest version of .Net framework(4.5). In the Data Annotation, we generally use the properties and put the validation on the properties so that throughout the application, wherever that property is used, it will be automatically validated and we don't need to validate it again and again as we were doing in older versions of visual studio. Now it will validate the Empid wherever we will use this model. So by this way, we can validate all our field as well as the custom validator also possible. We can use RegEx here to be validated using the Regular expression etc.